Khandala is a small hill-station perched atop the lush valleys and greenery of the Sahayadri mountain range. Located at the southern part of Maharashtra, the generosity of nature is well displayed in its ethereal beauty. The weather at the hill station generally remains pleasant throughout the year, the reason being its location - at a considerable height above the sea level (625 m). The temperature falls to a minimum of 12 deg C in winters, while in summers, the temperature rises to a maximum of 36 deg C.
Hence, it remains a favorite among tourists from all parts of India and abroad, for its invigorating weather and bucolic innocence. 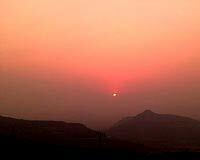 Summers in Khandala are generally warm, with the temperature rising during the months of April to June. The heat during the summers is not scorching. The sun-rays tickle the skin with assuaging warmth, unlike the summers in plains. On the other hand, winters in Khandala (November-February) present a comparatively cooler climate. The weather is enjoyable, without any uncomfortably-numbing effect. During the month of June and September, the hill station of Khandala receives heavy south-western monsoon rains. Thus, it is advisable for tourists to avoid these two months if they are planning a vacation to Khandala. The best time to enjoy the beauty of the hill station is between the months of October and May, when it seems to be shining with all its luxury and bounty.